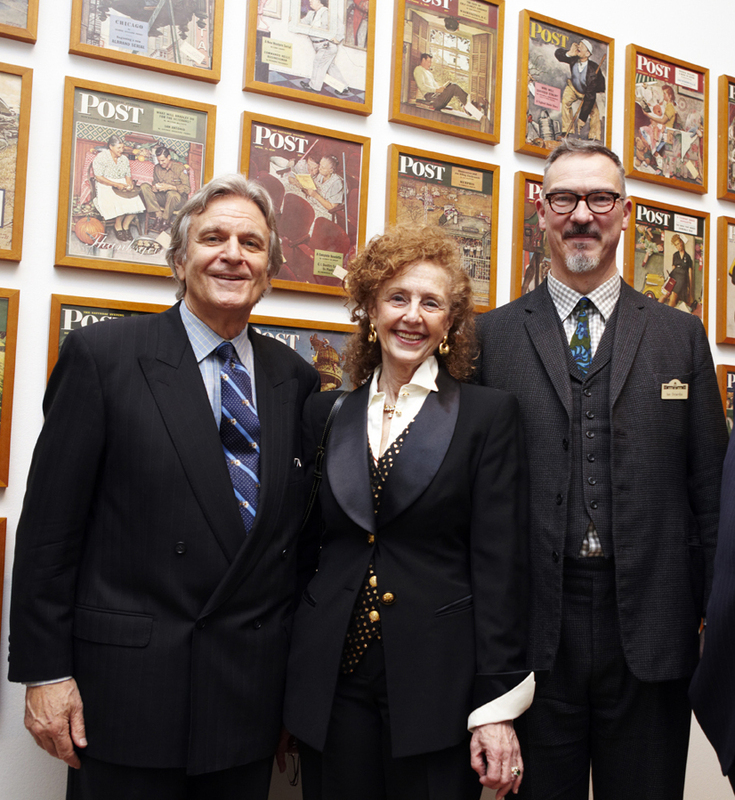 Norman Rockwell, the famous American illustrator, is the subject of his first ever exhibition in the UK at the Dulwich Picture Gallery, south London. He causes some art critics to bristle with indignation when he is described as an artist, but even if he wasn’t, does it matter as long as we enjoy his work? 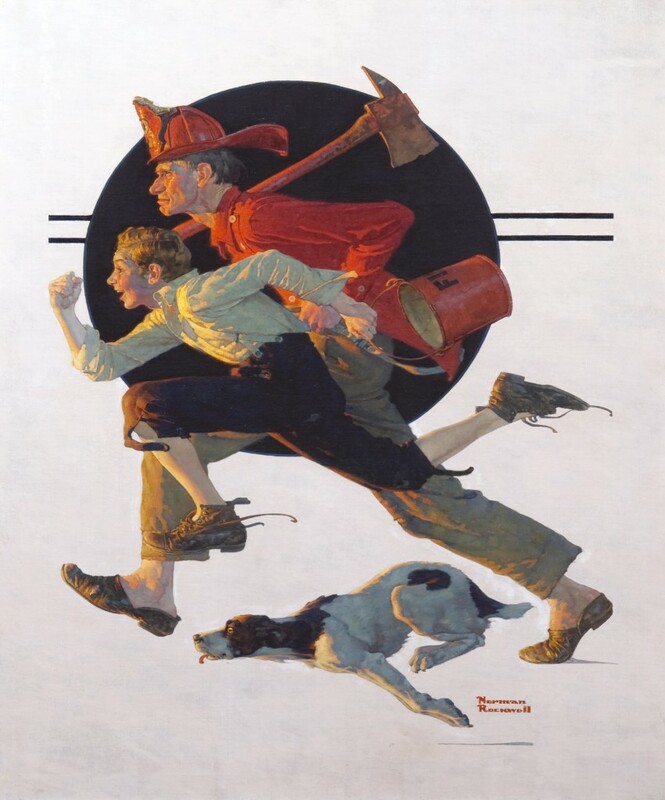 In some ways it is surprising that this exhibition marks a first of its kind.Rockwell is a national hero in America for his work as an illustrator which spanned more than sixty years. There is even an adjective – Rockwellian – coined to denote a specific style which epitomises traditional American values and beliefs. It is at once nostalgic, honest and homely, redolent of mom, apple pie and picket fences. Norman Rockwell painting The Toss, Saturday Evening Post cover, October 21, 1950. © 2011 National Museum of American Illustration, Newport, RI.Photo courtesy archives of American Illustrators Gallery, NYC. © SEP covers by SEPS, Curtis Publishing. Norman Rockwell was born on the Upper West Side of New York City in 1894, the son of a manager in a textile firm. Naturally talented, he would spend his mornings at high school and his afternoons at the Chase Art School before moving on to the National Academy of Design in New York and then the Art Students League. 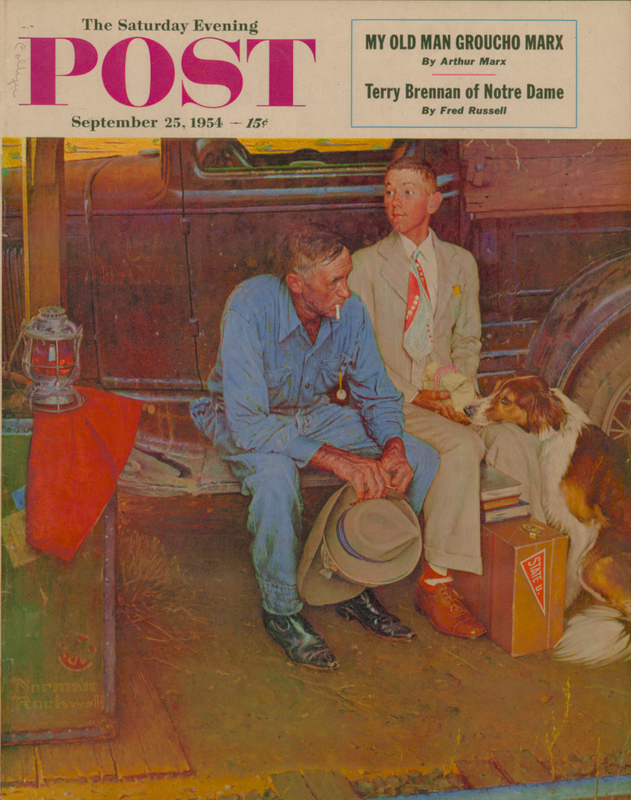 He received his first important commission in 1913 for his illustrations in Boys’ Life, published by the Boy Scouts of America and worked for them until 1916 when he began an association with the Saturday Evening Post which was to last 47 years and during which time he produced 322 original cover illustrations for the magazine. Looking back on his life, Rockwell said “I was showing the America I knew and observed to others, who might not have noticed.” But he also admitted that he painted things not as they were but “as I would like them to be” and this approach has antagonised certain critics who see only mawkishness and kitsch in his work. 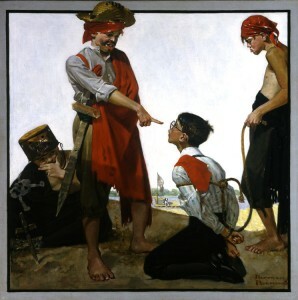 It must be said that claims for Rockwell as a great artist in the vein of the Old Masters, whom he much admired, are somewhat extreme, but perhaps this level of defensiveness is caused by the degree of acerbic criticism. However, people are often surprised to learn that Rockwell’s illustrations were first executed as oil paintings and of the amount of effort that he invested in each one. Cousin Reginald Plays Pirates. Country Gentleman, November 3, 1917 © 2010 NMAI and the AIG. 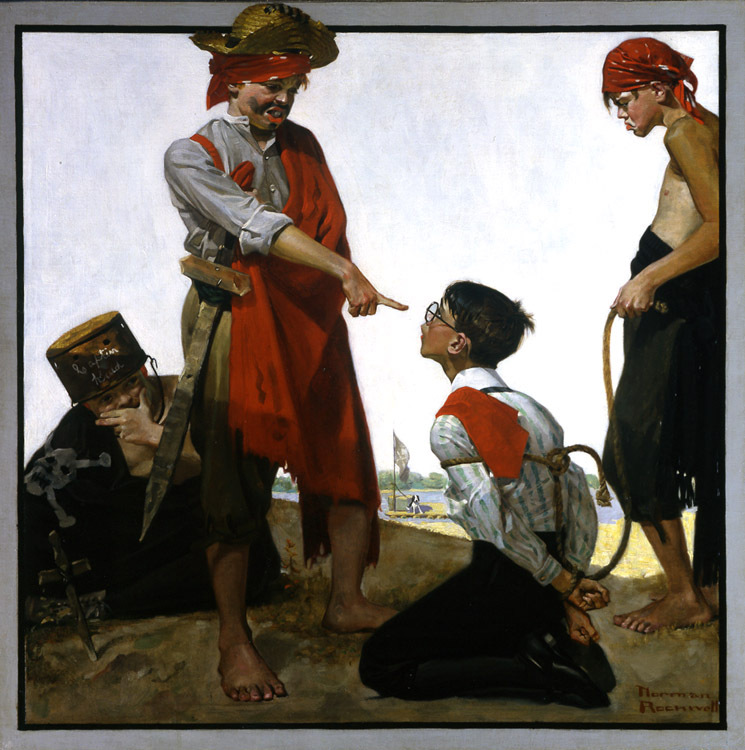 Looking at Rockwell’s work, such as the early Cousin Reginald Plays Pirates of 1917 for Country Gentleman magazine, Rockwell displays a style typical of the period, harking back to an illustrative approach more typical of the previous century. The Gentleman covers were often used to illustrate stories in the magazine itself or simply to sell the issue with an arresting image and Rockwell painted Reginald 32 times in all for the publication, such was the character’s popularity. Reginald is shown here as a harmless city boy picked on by his country cousins for being different. Held captive by ‘pirates’ who sport home-made weaponry, Reginald was modelled by a young boy called Claude Fitzhugh and Rockwell would often employ friends and neighbours in this way, sometimes even approaching strangers on the street whose features or posture he found interesting. 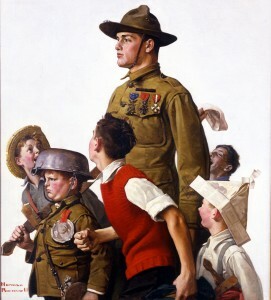 At this period, Rockwell featured children prominently in his work as in The Doughboy and his Admirers, a Post cover of 1919. Here a soldier is on parade after returning from the First World War. The boys run alongside him; to them he is a hero, but he has seen the reality of conflict and stares seriously ahead. The medals he wears were scrupulously researched by Rockwell, who himself served in the Naval Reserve, while the boys rely again on domestic utensils, the medal being a pie crimper, the boy’s helmet a kitchen pot. The Doughboy and his Admirers, SEP February 22, 1919. © 2011 NMAI, AIG and Curtis Publishing. According to a 1946 biography by Arthur Guptill, Rockwell believed that “the first job is to hit on a good idea.” This he would then sketch out roughly while he sought out the right setting, models and props necessary for the final painting which would then become the illustration. From the late 1930s on, he would employ professional photographers to take pictures of his models in different settings and from different angles which he would then work on further in his studio with more sketches and photos as the work finally came together. One exception to this approach was a Post cover of 1931, Volunteer Firemen. This was Rockwell’s only attempt at creating a painting using dynamic symmetry, an ancient Greek method for designing art and architecture based on a proportional grid system derived from natural, geometric relationships. One of Rockwell’s influences was an American illustrator called Maxfield Parrish who used this system and Rockwell decided to try it for himself. “He laid this out in a proportional system so you could overlay the painting with a grid and see how all the angles come together and become a balance for the work,” says Laurence Cutler. Here the veteran fire-fighter runs grim-faced towards the blaze, the flames reflected in his face, an axe over his shoulder but still wearing his slippers, so quick has been his response. The young boy runs alongside, excited and laughing, carrying his fire bucket on what could be his first ‘shout’. The dog just thinks it’s a game and runs for the sheer fun of it. Rockwell never again attempted to use dynamic symmetry, finding it “too difficult and time-consuming”, but the illustration does show one of Rockwell’s great skills, knowing exactly when to capture the action in order to bring out the story to its full. In the catalogue, the Cutlers state that Rockwell’s “internal art of ‘storytelling’ integrated with his external skills as an artist, merged into an incredible facility to judge the perfect moment at which to stop the action…and capture it on canvas…His covers were a whole story portrayed within a single image – it is what sold the magazines.” This ability to tell a sometimes complex story in one ‘take’ is highly cinematic. Indeed, Rockwell once said that if he had not been a painter he would have liked to have been a movie director, so perhaps it is not surprising that two of the biggest collectors of his work today are Steven Spielberg and George Lucas, two of the biggest names in Hollywood. Both men trace their love of Rockwell back to their childhoods when they would avidly await the arrival of the Post in the mailbox on a Thursday (never a Saturday). They began collecting him before it became fashionable and have been doing so for thirty years. The auction record for a Rockwell was set in 2006 when the painting, Breaking Home Ties, of 1954 was sold for $15.4 million. Breaking Home Ties, SEP September 25, 1954. © 2011 NMAI, AIG and Curtis Publishing. Rockwell produced more than 5,000 works of art in his long career including commissions from film studios. 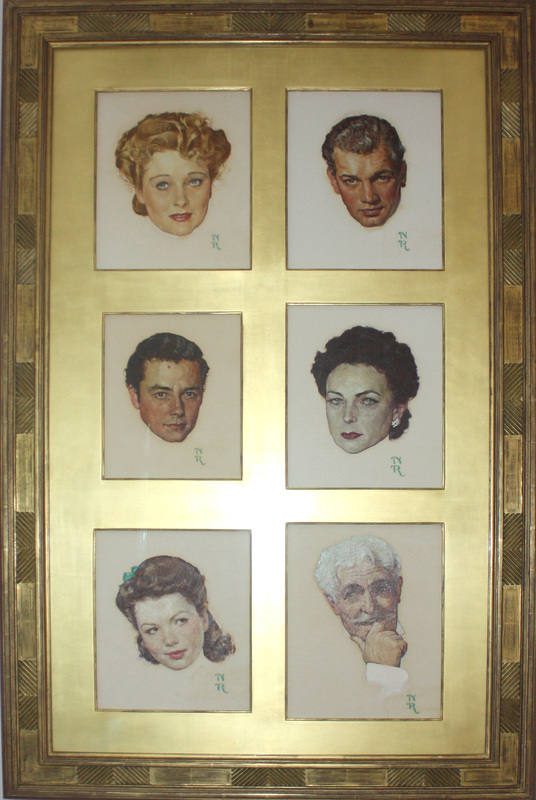 Orson Welles had been classed as a genius of the cinema after making Citizen Kane in 1941 and he asked Rockwell to paint the portraits of the six leading actors who featured in his next film, The Magnificent Ambersons of 1942, based on a novel by Booth Tarkington. 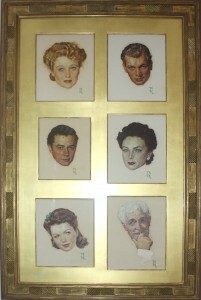 The portraits were used on the movie poster. Although the film features the turbulent fortunes of the wealthy Amberson family in their huge mansion, it begins in humbler surroundings, typical mid-West territory when a man with prospects but little money is rejected in marriage by a woman who marries into the Amberson wealth instead. Welles had been brought up in an area of Chicago called Library Park, described in Simon Callow’s biography of the great director as “Norman Rockwell territory, porches and gabled roofs, but even more it is Booth Tarkington.” Welles himself could never forget that he was born in Kenosha, Wisconsin, the type of small-town place embodied in much of Rockwell’s art, so this was a perfect union of book, director and illustrator. Rockwell obviously did his bit during the Second World War in portraying the American fighting man, but his approach was characteristically different to that of other artists. 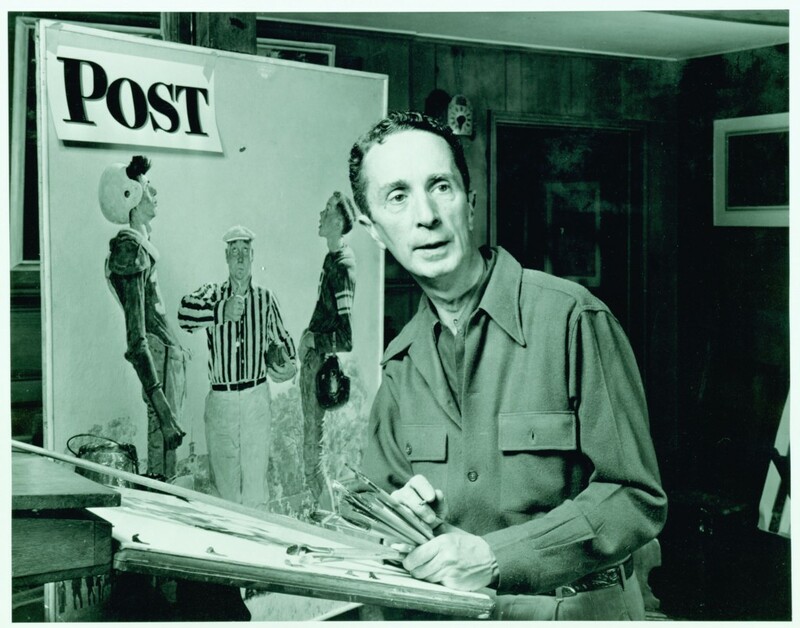 Where they would show horror and sadness, Rockwell found an all-purpose soldier in the shape of Willie Gillis, a character he portrayed on eleven Post covers from 1941 to 1946. His model was Robert Buck whom Rockwell discovered, very appropriately, at a square dance in Arlington. Buck was unfit for military service but suited the artist’s purposes entirely. 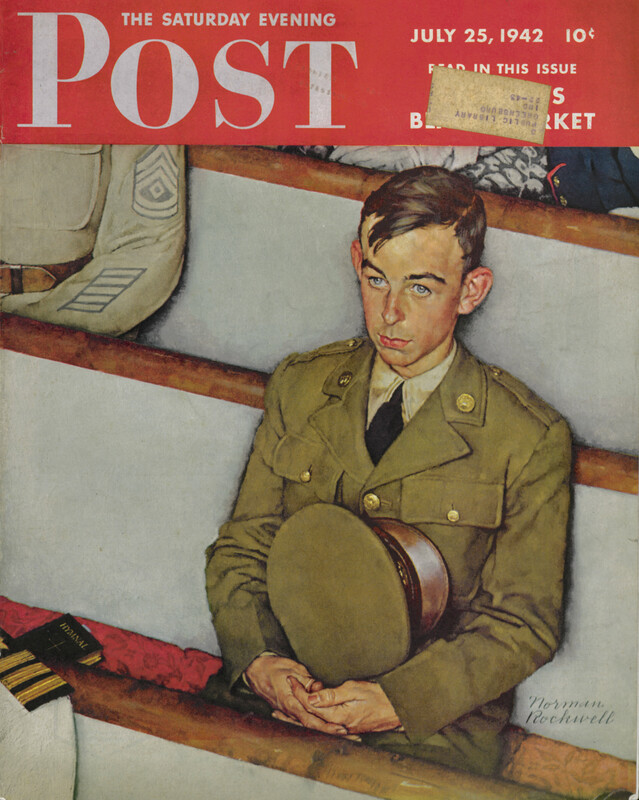 After Rockwell painted the first few covers, Buck managed to enlist in the Naval Air Service, so Rockwell completed the series by using photographs of Buck in various settings until he returned from the war. The Cutlers see Gillis as an early example of the anti-hero who was to feature so prominently after the war in books and film. He is, of a sort, but it seems that he more readily signified Rockwell’s approach to his work and the world. He liked ordinary people and while there is a war to fight and a common cause, he eschews the typical heroic fighting man for his own John Doe, the American everyman. Rockwell would have been as uncomfortable depicting stereotypical, armed he-men as he would painting the horrific elements of warfare. He left that to others while his approach mirrored his best Post work. It is a mass-communicator’s dream – appealing to the largest number via an easy-to-understand message. In Church of 1942, in particular, seems to speak of the quiet strength embodied in the ordinary GI. Gillis is a private, but he is seen here between an officer and a master sergeant, but no less a man for that. There is also a sense that all are equal in the eyes of God. Rockwell took this idea, expressed before America entered the conflict, and adapted it for war use. 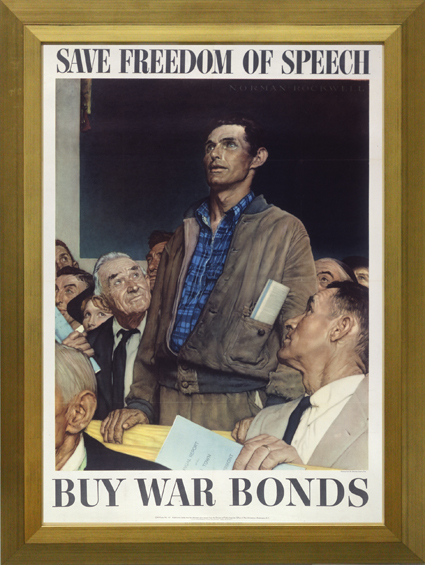 He took seven months to paint The Four Freedoms, once more using local models from his home town of Arlington, and pitched his work to the authorities in Washington in 1943. But they were initially rejected by the US government who wanted to use accepted ‘artists’ to depict realistic war scenarios. On his way back from Washington, Rockwell stopped in Philadelphia to show the idea to Post editor Ben Hibbs who immediately recognised the importance of the four artworks which became a huge success in America as well as abroad. The original paintings toured the US helping to sell war bonds. The final sum raised was $132 million, worth approximately $1.6 billion in today’s money. The other interesting feature of work such as The Four Freedoms and the humble Willie Gillis, seen in a variety of domestic or amusing settings but never in action, is that Rockwell was using his love of America and its traditions to show, not the evil nature and atrocities of the enemy as others did, but the homeland and how important it was to defend its values. 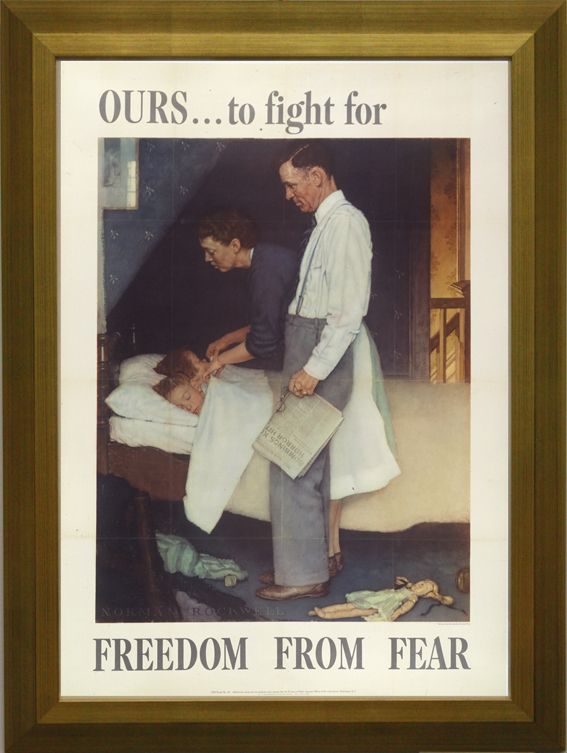 Rockwell led Americans from the horrors of the war into Eisenhower’s American Dream. Although the Cold War and the threat of nuclear annihilation were never far from the surface, Americans craved re-assurance, not fear, and Rockwell provided this with such Post covers as The Bridge Game – The Bid of 1948. Rockwell knew nothing about bridge and required the help of an expert and a wooden plank in order to achieve this aerial perspective showing a realistic hand. The plank was nailed to the balcony floor of his photographer’s studio over a table posed with four models. Each model held cards carefully arranged by ‘Red’, Rockwell’s Chicagoan bridge expert. The artist then asked the snapper to venture out to the plank’s edge to take a bird’s-eye shot straight down to enable him to create the cover image. Any bridge aficionado would start to play out the hand while any casual reader would find the viewpoint intriguing. Rockwell’s first marriage had ended in divorce and his second in the death of his wife, but in his third partner, Molly Punderson, he seems to have found a kindred soul. 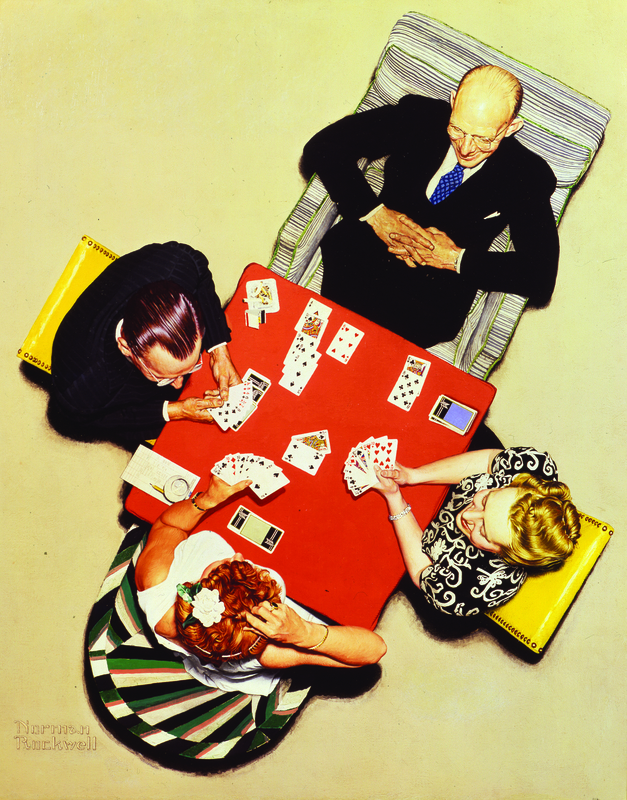 She, like him, held liberal views and a change certainly seems to have come over Rockwell as the ’50s drew to a close. A hint is provided in Boy Graduate, a Post cover of 1959. At first sight, this is the usual, rosy Rockwellian view of the future. The young graduate embodies hope, diploma in hand. But the newspaper headlines behind him tell a different story – “Khrushchev Warns West of War Danger”, “UN Atom Study Panel Sees Fall-Out Peril”, “Inflation Number-One Problem”, “State Officials to Seek US Help for Job Woes”. 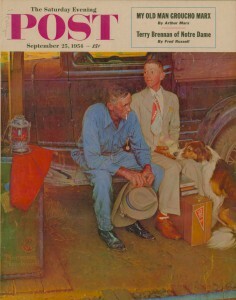 The Post was moving into new territory and Rockwell was a willing worker. The fact that he used his own son, Tom, as his model to represent America’s future is also telling. And indeed, the times they were changing. Although Rockwell’s autobiography was serialised over a number of issues in the Post in 1960, it marked the beginning of the end of their long association. Despite the magazine now commissioning him to make portraits of major world figures such as Nehru, Nasser and President Kennedy, Rockwell was frustrated by what he saw as the limitations of the work, fine though it often was. 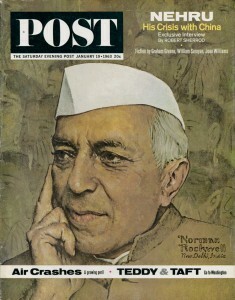 Nehru, SEP January 19, 1963. © 2011 NMAI, AIG and Curtis Publishing. He left the Post in 1963 for Look magazine where he was given leeway to choose his own projects and where he could cover the major issues of the day, usually in the form of a double-page spread inside the periodical. So he tackles segregation in The Problem We All Live With of 1964. Based on the story of Ruby Bridges, who was shown around the world walking to her New Orleans school on the first day of de-segregation, her brave stance is emphasised by the cropping of the heads of the US marshals escorting her and this provides yet another Spielberg link.In his 1982 film ER: The Extraterrestrial, the diminutive alien is seen hiding from police and government officials who are all shot from the waist down, so stressing his vulnerability against the powers of authority. It is difficult not to see this as a homage to Rockwell. Another fine painting from the Look period was Russian Schoolroom, part of a series of articles on the country published in 1967. A group of typically diligent Soviet schoolchildren look towards the teacher, out of view left, facing a bust of Lenin strewn with flowers. They wear their red Young Communist neckerchiefs and a slogan on the wall behind them tells them to “Study and Learn”. But one pupil looks away to his left, just like any schoolboy losing attention and finding something more interesting to see outside. He is a possible non-conformist, dreaming of other things. 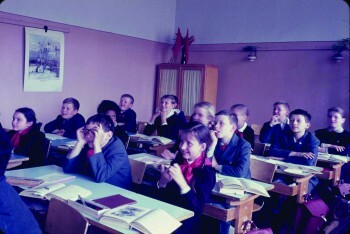 Tellingly, in the photo studies taken of the class for Rockwell’s final painting, this pupil is actually paying close attention to the teacher, eyes front, so perhaps Rockwell had subverted the image to make a subtle political point. 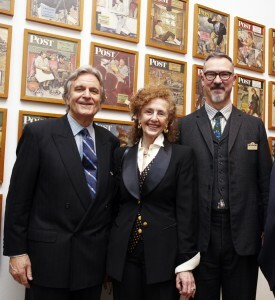 Norman Rockwell’s America continues at the Dulwich Picture Gallery until March 27, 2011. Thereafter it moves to the National Museum of American Illustration from May 28, 2011 through the summer months. There is also an exhibition on Rockwell and his use of photography at the Brooklyn Museum, New York, until April, 10, 2011.